Today the second solar panel arrived for my classroom XO laptops. This one came directly from China. It is so amazing to me that I can order something from a small company in China, and it will be delivered to my doorstep. 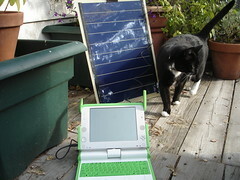 Anyway, it's here, and now the goal of powering one laptop by solar power all year long will change. We'll hopefully be able to say that half our laptops are solar powered. We shall see... I designated "Mark Ahlness @roomtwelve.com" to be our second solar XO. It is the one I bought last November in the G1G1 program, and it is the one that has been used the most. It'll be interesting to see how the battery charges, holds, and so on. The other solar powered XO is "Jude @roomtwelve.com" - the newest and least used XO over the past year. All four XO's have been upgraded to OS 8.2 - which my kids are really loving. So many new activities - and the interface is really, really improved. My classroom XO's, all with names ending in "@roomtwelve.com", connect to xo1share.org Head there if you'd like to chat, etc. with my third graders. Tim, the solar power try is a definite learning experience for all. Not as easy as I thought to accomplish, I've learned a ton in the process from some very smart folks. Here's a link to the forum topic I started, with several responses/suggestions.